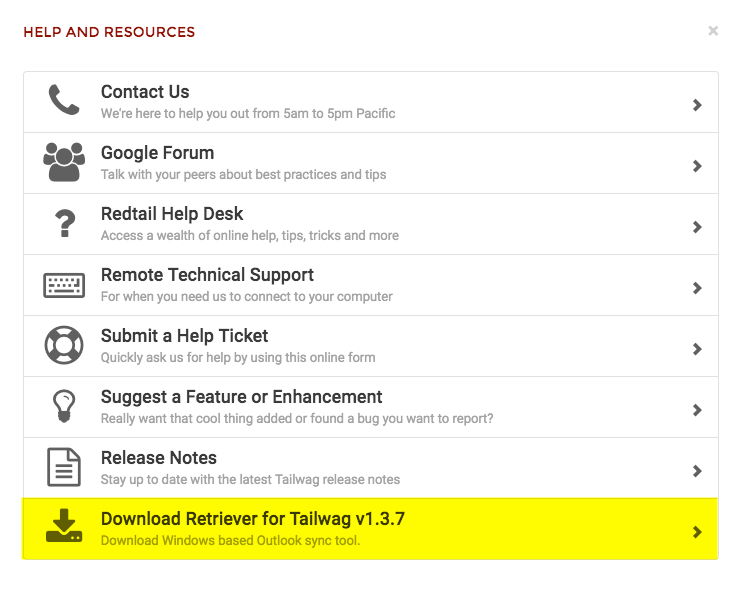 Retriever for Tailwag is a synchronization application built using the Microsoft .NET Framework. The application allows you to synchronize your Contacts and Calendar Activities between Redtail CRM and a locally installed version (Non Click-to-run) of Microsoft Outlook. You should see a message asking if you want to Run or Save Retriever after clicking the download link - select "Run". Note: you'll only want to download and use Retriever on one machine for use with a specific username / password combination. If you are using Retriever to sync using the same credentials on multiple machines, you will see duplicate Calendar Activities. If you don’t already have Microsoft .NET Framework 4.0 on your machine, you will be prompted to download the framework prior to installation of Retriever. Once you have Microsoft .NET Framework 4.0 on your machine, you can click the download link above - then, select the option to "Run." After downloading Retriever, you will need to install it on your computer, using the Installation Wizard included with the download. The Folder path displayed above is the default location for installing Retriever for Tailwag. Note as well that we've checked off "Just Me" in our example - if you are the admin user of a computer that is shared by several people with their own logins for the computer, and you want them all to be able to log into Retriever for Tailwag, you can instead check off "Everyone." After making your selections, click Next. You'll then see a Confirm Installation screen - click Next and installation will begin. After you see the indication that installation is complete, click Close. Double click this icon to bring up your Setup Wizard for Retriever (first time only - in the future double-clicking will take you straight to the login dialog). Start with Windows - if checked, Retriever will open when you start your computer. (You'll want to choose this option if you plan to Auto Sync). Start minimized in System Tray - if checked, Retriever will open minimized in Windows' System Tray, rather than on your screen. We recommend this option if you also select "Start with Windows." Auto Sync - if you select this option, you can indicate a frequency in Days, Hours or Minutes for your Auto Sync to occur. Note: Although you are able to sync in minutes, we highly recommend auto syncing no more than every 1 hour. Notify about upcoming activities - if you select this option, you will be provided with pop up reminders for your Redtail Calendar items. For instance, if you selected this option and set it to "30 Minutes prior," you would receive popup reminders from Redtail 30 minutes prior to the due date/time for each of your Redtail Calendar items. Note: these reminders are contingent upon Retriever being open (logged into). If you want these notifications, it's best to check off the Start with Windows option, so that you are logged into Retriever upon logging into Windows. Download Contacts from Redtail to Outlook - if checked, the contacts in your designated Quicklist(s) will sync from Redtail to Outlook. See this post for what contact data will sync from Redtail to Outlook. Save Birthdays when downloading Contacts to Outlook - check to save Birthday information on Contacts in Outlook. Please note that Outlook will automatically create birthday reminder appointments in your Outlook calendar. Also note that Retriever will only attempt to sync Date of Birth for contacts on the FIRST time a contact is synced. Remove Birthday reminders from Outlook Calendar - Remove Birthday reminder appointments from your Outlook calendar. After clicking this, an Outlook Select Folder dialog will appear where you can make this selection. Download Calendar - Check to sync your Redtail Calendar items to your Outlook calendar for the date range you specify here. We highly recommend not syncing more than a year at a time to speed the syncing process up. Note: at this time you do have to manually adjust this date range from time to time, as you near the end of your designated time frame. Update Redtail Calendar - If checked, updated made to calendar items in Outlook that were previously synced from Redtail to Outlook will appear in Redtail after you sync. Upload new activities created in Outlook to Redtail - If checked, calendar items created in Outlook will sync to Redtail. Upload activities marked as "Private" - If checked, calendar items marked as "Private" in Outlook will sync to Redtail. Remove Reminder Alerts - If checked, Reminder Alerts will not pop up in Outlook for Calendar items synced from Redtail to Outlook. Download Tasks - Check to sync your Redtail Calendar items with an Activity Type of Task to your Outlook Tasks for the date range you indicate. We highly recommend not syncing more than a year at a time to speed the syncing process up. Note: at this time you do have to manually adjust this date range from time to time, as you near the end of your designated timeframe. Download completed items - If you select this option, Calendar items in Redtail with an Activity Type of Task that have been marked complete will sync to Outlook Tasks. If you leave this unchecked, Tasks that have been marked complete in Redtail will be removed from Outlook. Update Redtail Tasks - If checked, updates made to Tasks in Outlook that were previously synced from Redtail to Outlook will appear in Redtail after you sync. Upload new activities created in Outlook to Redtail - If checked, Tasks created in Outlook will sync to Redtail. Upload activities marked as "Private" - If checked, Tasks in Outlook marked as "Private" will sync to Redtail. Remove Reminder Alerts - If checked, Reminder Alerts will not pop up in Outlook for Task items synced from Redtail to Outlook. You should use the same Username and Password that you use for your Redtail account to log in to Retriever. Reminders - if, on your General Options in Preferences, you elect the "Notify about Upcoming Activities" option, clicking this will bring up your Redtail CRM Reminder balloon in your system tray from the Retriever icon. Clicking on one of these three options will allow you to clear previously synced Contact, Calendar or Task data from Outlook. These options can come in handy if you inadvertently synced data that you did not mean to sync. Were you to use the above Quicklists setup you would be syncing two Quicklists to your designated Contacts folder in Outlook.